The most successful indoor herb gardens are well planned. Even if your style is more relaxed, the compact design that a kitchen windowsill offers means that every herb should multi-task. Here are our choices for the 5 best herbs in an indoor herb garden. These herbs all grow very well with little fuss and can be grown quickly enough to keep up with the demands of a busy cook. Chives are a must have for a kitchen herb garden. They are so versatile, you may find that you use your chives at almost every meal. 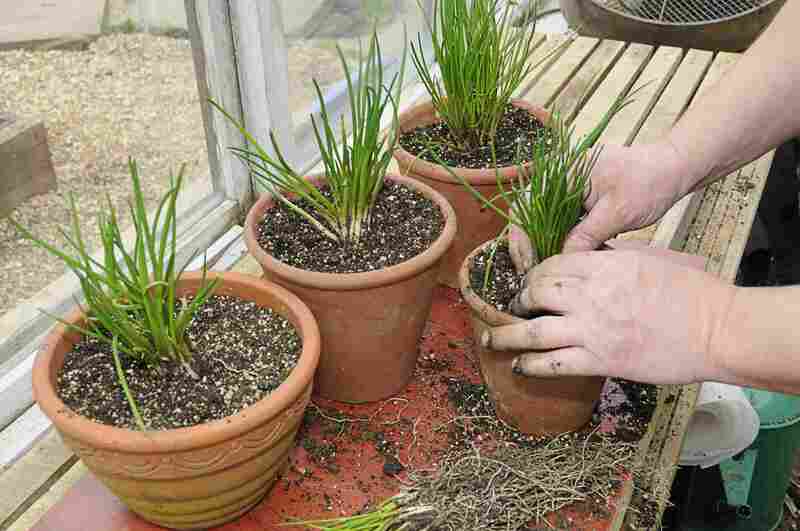 Easy to grow, chives demand only that you snip them back often, to keep from toppling over. If there was one herb to choose for your windowsill garden, chives should be it. Thyme is a powerhouse of flavor in a tiny package. Choose any variety that you prefer, but keep it trimmed tightly to fit your specific needs. The more you trim, the more tasty leaves you will be rewarded with. Thyme is great for both savory dishes and in a tea for colds and flu. French tarragon is a versatile herb, that needs to be in any kitchen herb garden. Because it lends itself well to any dairy or egg dishes, tarragon is a great way to round out a cook's garden. Use tarragon to bring savory taste to those winter comfort foods. I include tarragon for its ability to boost the taste of some foods that are often found at breakfast and brunch. Sweet marjoram is for anyone who loves the taste of fresh herbs in cooking. Use sweet marjoram for any dish that uses oregano, without the chance of bitterness. This is an easy to grow herb that is as versatile as it is delicious. Sage is a fantastic herb for a kitchen herb garden. It is used medicinally, as a tea for sore throats and colds. It is also a commonly used herb in savory meat or poultry dishes. Sage comes in many varieties and growing habits. I choose sage as a top 5 kitchen herb garden for its versatility as both a healing and cooking herb.